Why not enjoy twelve flavors instead of one? A bag of delicious gourmet Gummies, full of assorted flavors. 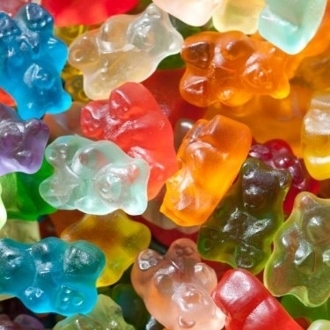 A Colorful Mix of 12 Different Flavored Gourment Gummi Bears Wild Cherry, Pink Grape Fruit, Watermelon, Strawberry, Orange, Blue Raspberry, Lime, Grape, Green Apple, Mango, Pineapple, Lemon. Case: 4 x 5 Pound Bags. Bag contains 5 pounds of World's Best Gummis Gourmet 12-Flavors Gummy Bears Candy. Allergy & Nutritional Information : Gummi's are Produced in a Plant which Processes Peanuts, Tree Nuts, Soy, Wheat, Milk Products.